Want the midsection of a fitness model? Get in the gym with Greg Plitt to build your own pack of Apollo-worthy abs. 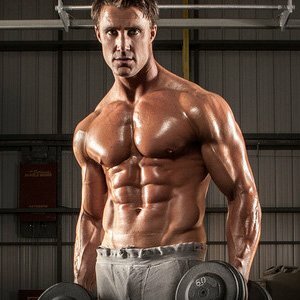 Greg Plitt has appeared on over 100 fitness magazine covers and 25 romance novels in the last four years, and is undisputedly America's #1 male fitness model. Greg is the face of Thierry Mugler's world wide fragrance campaigns, Angel Men and Ice Men, as well as being a sponsored athlete for MET-Rx Shaping Every Body, Under Armour Performance, Appeal and Gold's Gym. Greg has done commercials for Old Spice, Dodge Ram Trucks, ESPN, Under Armour, MET-Rx, PETA and countless infomercials. Before his acting and modeling career, Greg Plitt was a U.S. Army Ranger, a graduate of West Point Military Academy, former Army Captain and Company Commander of 184 soldiers, a two-time All-American wrestler and a Pro-rated skydiver with over 1500 jumps to date. Abdominals are a muscle group like no other (maybe besides calves) that can be worked to exhaustion every day and still not be overtrained. I work an abdominal routine in at the end of every workout for 10-15 minutes straight. I usually pick anywhere from 3 to 5 exercises, each of which targets a different part of the abdominal core, and run through as many circuits as I can in the allotted 10-15 minutes (targeting for 4-5 circuits). Each circuit will consist of one set of 30-40 reps (or to failure for a particular exercise) before moving to the next exercise, with no rest period for the entire circuit, just travel time rest between exercises. In essence, you are doing 4-5 sets per exercise to failure (or 30-40 reps, depending on the exercise). Believe it or not, hanging upside down is a good way to keep the spine aligned since weight is removed by gravity! If you have access to gravity boots, try inverted crunches. The inversion causes gravity to add major intensity to the crunch. While inverted and performing this exercise, your lower body has no choice but to stabilize and hold you in place, in order to control the crunch. The last added benefit is that you can take things to an even higher level by holding weights during the crunch to further enhance the movement's effectiveness. Greg Says - Gravity boots help to de-compress your spine while getting a great core workout. The entire abdominal core is worked with gravity boot sit-ups, 4-5 sets with each set to failure (these are harder; work your way up to them and always dismount in control, as you can get temporarily lightheaded after completing a set and lose your balance). Lie face up on the floor with your feet pointed toward a low-pulley cable, one that already has ankle straps attached to it. Wrap the straps around your ankles. Make sure the fit is snug and secure! "If your goal is to get a toned midsection and get a six-pack to pop, pick a weight that allows you to get 30 in and push it to 40 reps if possible." Now, lift your feet to bend your knees and hips to 90-degree angles, keeping your arms flat on the floor at your sides for balance. Curl your knees toward your chest. Hold this position for a one-count, and then slowly return to the start. Take your time with this movement, making certain to get a hard contraction at the top. Greg Says - If your goal is to get a toned midsection and get a six-pack to pop, pick a weight that allows you to get 30 in and push it to 40 reps if possible. If you already have a six-pack and want a deeper valley between your ab bellies, pick as heavy a weight as you can lift, while in control, for 8-10 reps. This exercise focuses on the lower abdominal region. Grab onto a high bar, or set yourself up in suspended arm supports. Once you're positioned correctly, cross the feet. Slowly lift your knees up toward the ceiling. While doing this, simultaneously twist at the hips so that the knees face either right or left, depending on the side you wish to work. After the legs are parallel to the floor and the knees have reached the correct height - in line with the hips - the athlete may return to the starting position. Again, be sure to move with care and caution. Quick, ballistic "jolts" expose the groin and even the obliques to possible injury. Greg Says - Hanging twists are great to build the sidewalls of your abdominals as well as targeting your lower abdominal region. Again, like Low Cable Sit-Ups, if you are going for a six-pack, go with your body weight for 4-5 sets of 30-40 reps or to failure, whichever comes first. If you want deeper ab bellies, go for 8-10 reps but add weight to your feet via straps connected to your ankle on a low pulley or by using your feet to pinch a dumbbell. Kneel below a high pulley. Grasp cable rope attachment with both hands. Place wrists against head. With your hips set, flex your waist in such a way that your elbows travel roughly toward the middle of the quads. Return and repeat. Note that most of the movement occurs in the waist, not in the hips. Try to keep your neck in a neutral position with space between the chin and sternum. Greg Says - Rope crunches are great for targeting the upper region of the abdominals. I like to go heavier here and shoot for 15 reps; again doing 4-5 sets in a circuit training cycle. The cycle should be set up so that each exercise targets a different region of the abs without ever targeting the same region back-to-back in the cycle. Start by hanging from a dip bar, with arms slightly wider than shoulder-width apart and your legs hanging straight down. If possible, use arm straps to eliminate the stress on your forearms. Raise your knees as high as you can into your chest and then lower your knees back down to the starting position. Don't let yourself "swing," otherwise this becomes a momentum-first exercise and its effectiveness is greatly reduced. The entire motion should be done in a smooth, controlled manner, with the downward movement no faster than the upward. Greg Says - Hanging knee raises focus the stress to the lower region of the abdominals. It is imperative that you bring your knees all the way to your chest to get the most out of every rep. 30 reps is the goal for each of the 4-5 cycle sets. Captain Kristopher Ulbrich has two priorities: staying fit, and making sure that every man comes home.